For anyone interested in blacksmithing you might like to visit the Ferrous Festival 2019 in Hereford City Centre. Below is a link to the website and a bit more information! After an amazing festival in October 2017, Hereford Business Improvement District and Hereford College of Arts are enormously proud to present the second Hereford Festival of Artist Blacksmithing this April. The ten-day festival celebrates the natural world through the craft of blacksmithing. You can have a go at forging your very own seed marker to take home, along with your own wildflower seeds to plant and help support the bees. There is also a stunning exhibition from primary schools around Herefordshire of handcrafted tin plaques which celebrate the natural environment and there is the opportunity to make a plaque during the festival. Recently, Hereford College of Arts lecturer, Ambrose Burne set a challenge for students to make the most of a small piece of metal (150mm by 20mm x 20 mm), a challenge which artist blacksmiths around the world have taken up. Be the first to see their work in this extraordinary and beautiful exhibition before it goes on tour. There are also workshops, films, exhibitions and talks from renowned blacksmiths that celebrate the blacksmithing tradition. All are very welcome at the festival, and there are activities the whole family can get involved in. The Festival acts as a showcase for the remarkable range of home-grown artistic and cultural talent in Herefordshire and is already establishing a reputation as the place for international metal artists to exhibit their work. The collaboration between Hereford College of Arts and the Hereford Business Improvement District has been inspiring to both partners – in the very best location, Hereford city centre. With its hundreds of years of history and thriving commercial centre, we are able to reveal some of the very best in contemporary design and modern craftsmanship and look forward to developing this exceptional role for our city further this year and into the future. This is your chance to have a hands-on experience of blacksmithing and help save the bees. 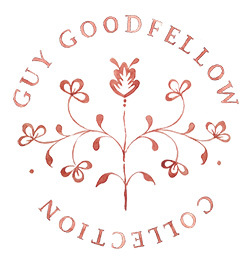 The festival will bring hot metal forges to High Town, each run by an experienced blacksmith who will be able to guide you through the process of creating your own seed marker which you get to take home, along with your own wildflower seeds. Throughout the weekend, hundreds of seed markers will be made, and we hope that seeds will be planted in every garden and green space to help to reverse the bee decline. We have already lost 13 species, and another 35 are currently at risk. Wouldn’t it be fantastic if your neighbourhood was full of flourishing flowers for you and the bees to enjoy! If you haven’t booked your forging slot in advance, there may still be slots available on the day, so come to the forge area in High Town to book. Paul Mikula is a traditionally trained South African Blacksmith with 28 years' experience, specialising in forging functional, decorative and sculptural ironworks. Due to failing infrastructure and a collapsing power grid, he decided to convert his business and house to run off-grid. His family lives on 165 hectares of veldt overlooking a nuclear facility. There they have a small hotel, Paul's forge and three households living entirely off-grid. Solar power takes care of their energy needs and three massive reservoirs store rainwater. Paul was invited to run a masterclass at Hereford College of Arts which is a project that embodies collaboration with artist blacksmith students from across all three years. Students came together with this international master to work on a design, and the piece they made with Paul was called ‘African Sun Mandala'. The design represents the sun of Africa and growth from the centre of the Mandala. The individual pieces making up the mandala incorporated simple and technically difficult blacksmithing processes so that the students had the chance to forge according to their ability. Martha Jones, a Photography degree student at Hereford College of Arts, produced a documentary photography essay of the masterclass, encapsulating the process of blacksmiths forging together to create this breathtaking cultural piece. Artist Blacksmith students at Hereford College of Arts were set a challenging project by lecturer Ambrose Burne to explore their creativity and the process of blacksmithing. Students were given a piece of metal measuring 150mm x 20mm x 20mm and set a brief to explore what was possible using their technical expertise and creativity. The results were exciting and students were encouraged to post their work on social media: that's where the real story began. Forged metal designers from around the world started to join in, making artefacts within the same constraints as the students and sharing images of their work. The exhibition displays a constellation of over 200 forged metal pieces from 12 different countries, including Mexico, Norway and Estonia. This challenge is a celebration of the art of forging, of exploring what is possible in the medium of metal. Be the first to see this extraordinary and beautiful exhibition at our festival before it goes on to tour the world. Follow #150mmchallenge on Instagram to see how the challenge develops. An exhibition of work by Ambrose Burne, an artist blacksmith who finds inspiration in the natural world as a design source. Sculptural forms are derived from studying how growth and movement is visually expressed in the natural world; focusing on the logic and progression of components in relation to overall form. He seeks out methods of manipulating metal; drawing out, spreading, bending and punching, that will emphasise the essential qualities of the original form. Vitally important to all Ambrose’s designs is that each element, component or fixing, is beneficial to both structure and overall aesthetic, he is constantly examining historical blacksmithing techniques to find the best methods to achieve his vision. The result is that his work is rich, both in historical references and contemporary design values. The National Heritage Ironwork Group was formed to advance public awareness and knowledge of ironwork, to define and promote high standards in conservation and restoration through developing and promoting educational opportunities. This Exhibition highlights Britain's rich contribution to the history of Wrought and Cast iron production and its use in the decorative arts. An international forged metal art exhibition from the faculty staff of Gothenburg University HDK Steneby Metal Art Programme and Steneby School of Crafts. 'Celebrating the Natural World' is a project that celebrates the early craft skills of primary school children. Students from Hereford College of Arts Artist Blacksmithing degree course have run pop-up workshops for children in eight Hereford primary schools, providing them with an introduction to the tools and process of the blacksmith. Using small hammers and different shaped punches, and inspired by the natural world, the children have created embossed pictures on small metal plaques. The children have produced a menagerie – fish, birds, animals, and insects. There is an opportunity for children to make a plaque during the main festival weekend 5-7th April; book a slot at the venue. A photographic exhibition of regional blacksmiths within their working environment, created by Hereford College of Arts Photography degree students Matthew Davies and William Pettit. These evocative portraits celebrate this traditional craft and the people who are passionate about it. The 'Emerging Practice' exhibition is a vibrant display of the very best in cutting-edge forged metal design and craftsmanship from this year's crop of emerging makers on the international-facing Artist Blacksmithing degree course at Hereford College of Arts. The exhibition explores, challenges and celebrates the blacksmithing tradition. Design and fine art objects will be on display, comprising vessels and containers, sound-making sculptures, kinetic art and more. The exhibition is a chance to see a new vision of a traditional craft through the eyes of emerging talent. This exhibition showcases a selection of works from three Artist Blacksmithing degree alumni who are now running their own forged metal design companies. An excellent selection of short films, documentary and animation, celebrating the art of blacksmithing throughout the ages. Ferrous Cinema is curated by MASH Cinema. Connections are the backbone of contemporary forged metal design; this exhibition celebrates a variety of connections made by Artist Blacksmithing Degree students. Simon Bushell is a travelling artist blacksmith and owner of The Nowhere Forge, a self-sufficient, sustainably powered mobile blacksmithing workshop. Simon spent four years building The Nowhere Forge and will be sharing his experience about living simply while maintaining a high quality of life and enjoyment. Over the main festival, The Nowhere Forge will be popping up across the city to demonstrate the art and craft of blacksmithing and to share Simon's truly inspiring life story. The festival crew are all students studying on the Artist Blacksmithing degree at Hereford College of Arts. The course is unique in the UK and has an international reputation for its place at the forefront of education in forged metal design, attracting students from across the world to study at our College Road Campus in Hereford. The programme encompasses a breadth of practice from architectural design to interior product and sculpture, all made from forged metal. If you are interested in finding out more, follow @herefordanvils on Instagram. I was contacted in the summer of 2017 about the potential for a sculpture to celebrate the change of use and recognise the historic use of this lovely old landmark building in Malmesbury in North Wiltshire - my home town. I was asked to identify a location for the sculpture and immediately wanted to use the space between the two beautiful arched stained glass windows to the roadside of the building - I also wanted people to look up at these windows as they passed the building so the height of the work was critical. 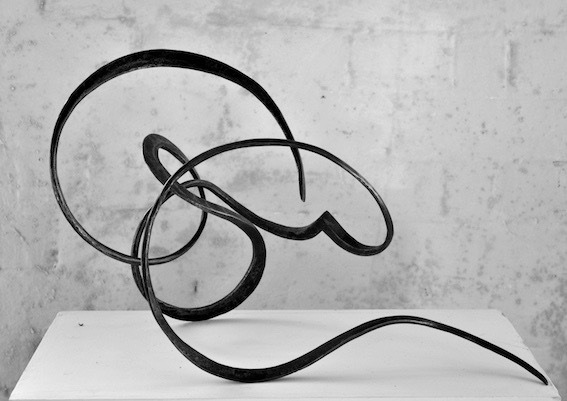 My sculptural work is known for being flowing and curvy; sensuous lines in steel that take the viewers encounter with my sculptures on a journey. For this sculpture I decided to go in a different direction and take the form of the Moravian Star as the basis for my work - studying the geometric possibilities of making a steel sculpture that had the 26 points of a true Moravian star structure. From this starting point I let my design develop and deconstructed the star shape while considering my blacksmithing techniques as the main means of making the work. Plenty of people in Malmesbury are familiar with my Dad www.hectorcoleironwork.co.uk as he taught them metal work or technical drawing at Malmesbury School from the late 60's to 1990's I thought it was a great chance for me to play homage to him and his historical forged weaponry influence on me. The finished sculpture has a certain Medieval-weaponry feel to it while also taking the form of a Moravian Star based on a dodecahedron central structure - this element to the sculpture is what gives it a light delicate feel - and when you stand underneath it and look up through it you can see the complex structure inside. Using different forged tapers sections in the star from flat bars hot-split or fire welded to angle iron forged to a taper the light plays on the surfaces at different angles and will change the dimensions of the work as the light changes. The finish is a modern etched zinc grey with a dash of 24ct Gold to take your eye up and away in the sky. The sculpture has been part of a big fundraising effort by the organisers of the renovation and restoration project of the old Moravian Church. I would like to thank Angela and William Sykes for being confident in my ability to create a sculpture for the space and the Athelstan Museum Team for working with me on the commissioning process. This project has been a big effort and for those who like to know how long a thing takes, I spent 71 hours on design, consultation and making a scale model and 151 hours were spent making the large scale sculpture, forging, cleaning, assembling, fabrication and finishing. It weighs 53kgs. Morgan Scoble-Rees my current workshop assistant and forger of long tapers! I have been working on a complex handrail panel with rivet details. The sections are forged then joined to each other with a steel rivet giving a secure traditional decorative join using the round head rivets as a feature. Here's the short film of the tool I made and how I use it for tricky riveting jobs like this one! It has been a busy year so far! I have made a large scale, split strand DNA sculpture for Winchester University Cosmic Walk. I have also finished the last window panel in a Sir John Soanes designed house which depicts the history of the house and local landscape. I am waiting to install another public art piece in Malmesbury - images to follow when the work is installed and have worked on a number of small commissions in-between. My Etsy gift shop https://www.etsy.com/uk/shop/MelissaColeGiftShop is starting to gain interest - I am selling smaller gift items here such as linked hearts, hooks, feathers and huge nails! I have had a part time blacksmith working with me this year and hope this will continue while he develops his skills and knowledge of our craft.